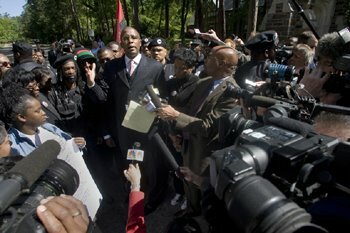 Black Panthers at Duke Demand Guilty Verdict & Nothing Less! The Black Panthers say if they don’t get their justice there will be no peace in the Durham community. Shabazz unveiled eight demands by the group, which included the “vigorous” investigation and prosecution of the alleged sexual assault that occurred during the party held by Duke men’s lacrosse players, the expulsion of all Duke students involved and an end to “private” meetings between Duke President Richard H. Brodhead, North Carolina Central University Chancellor James H. Ammons and Durham Mayor William Bell. Nearly 60 members of the Durham community, including university employees, students and faculty, strained to hear the speeches over the din created by two TV station helicopters hovering overhead. After the speeches were completed, Shabazz requested permission to march onto campus. Robert Dean, director of the Duke University Police Department, citing a prior agreement that the demonstration would not enter campus property and the desire of the university to avoid disruption during the start of the exam period for students, denied that request. Shabazz and his followers then marched along Duke University Road, across campus on Anderson Street and up Hillsborough Road and Markham Street to the house at 610 N. Buchanan Blvd. Shabazz said the community has eight demands, among them a trial and conviction for the defendants in the case and that the indicted students and other involved should be expelled. The accuser’s mother in the case told WRAL that family members did not ask the group to come to Durham, and they don’t want their help. Some allege the New Black Panthers Party is a separatist group and it is in the area to take advantage of the situation.